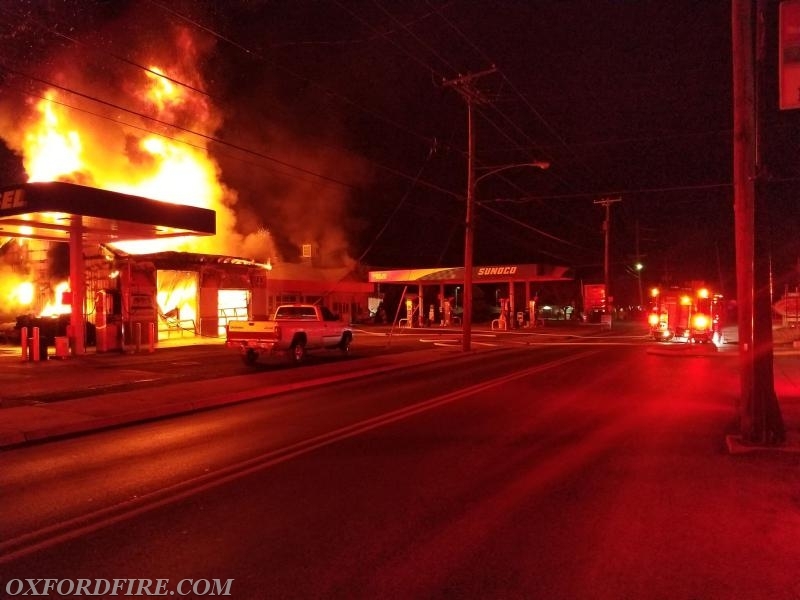 At 0023 hours, the Union Fire Company, along with the West Grove Fire Company (22), Community Fire Company of Rising Sun, MD (8), Cochranville Fire Company (27), and the Quarryville Fire Company (57), was alerted for a reported Building Fire at the Oxford Sunoco in the 200 block of South Third Street in the Borough of Oxford. 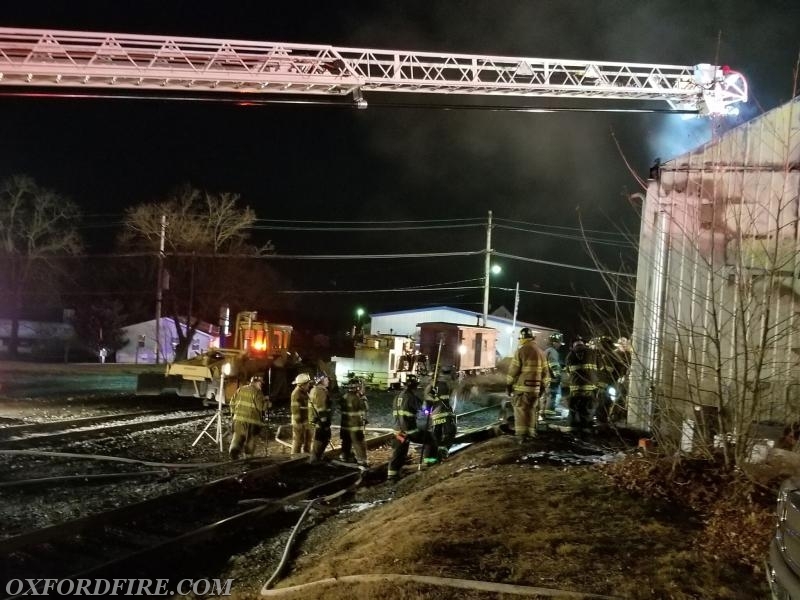 Multiple calls to 911 reported a working fire. 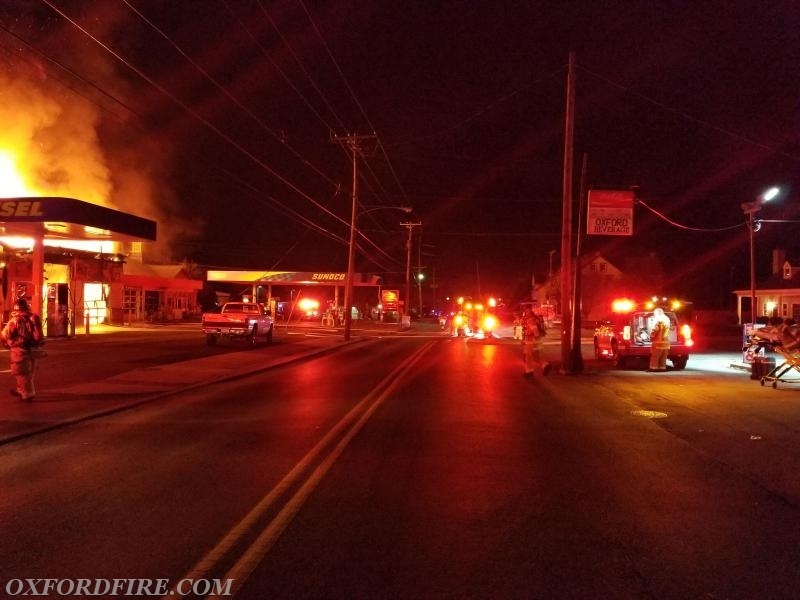 Chief 21 (Meadowcroft) responded and with the reports, requested the Working Fire Dispatch. Upon arrival, Chief 21 confirmed heavy smoke showing from the front of the building and established the "Third Street Command". Engine 21-1 (Captain Greene) arrived and took the hydrant at South Third Street and Summit Avenue. The crew lead off with the 2.5" Blitz Line. They began a brief defensive attack on the large bay doors, before making entry into the building. Ladder 21 (FF Messaros) arrived and backed into the north side parking lot. The Truck set up for master stream operations. The crew threw ground ladders to all sides. Engine 21-4 (FF B. Slauch) arrived from the south. 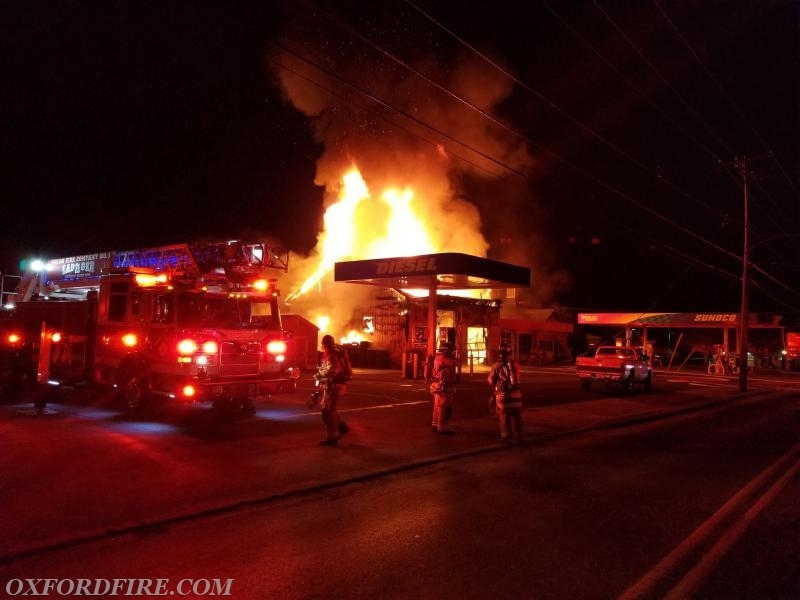 The crew stretched a 1.75" hand line and began to attack the fire. Engine 21-2 (Past Chief Fowler) arrived and dropped a second 5" supply to a hydrant at Summit and Penn Avenues. They would eventually be supplying Engine 22-1, which was supplying Ladder 21. Lieutenant 21 (Kelley) assumed the Operations Officer role. Rescue 27 staged in the parking lot of the Oxford Beverage across the street. The crew established the Rapid Intervention Team along Third Street. Rescue 27 was used to fill air cylinders throughout the incident. Truck 8 took the rear of the building and was also set up for master stream operations. They were supplied by Engine 813 from the hydrant at South and South Third Streets. Rescue 57 staged near the scene and the crew established the Rapid Intervention Team on the north side of the fire. 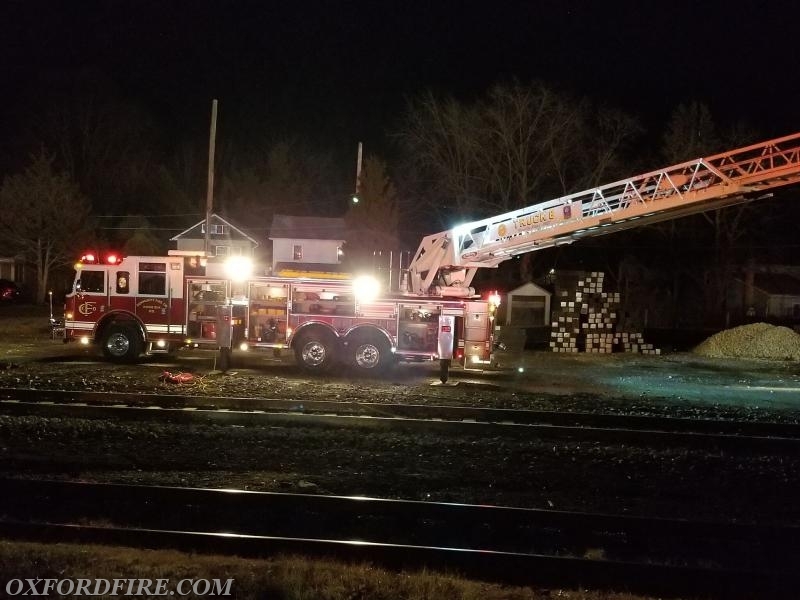 Once adequate water supplies were obtained, both Ladder 21 and Truck 8 began to flow their ladder pipes to extinguish the bulk of the fire. 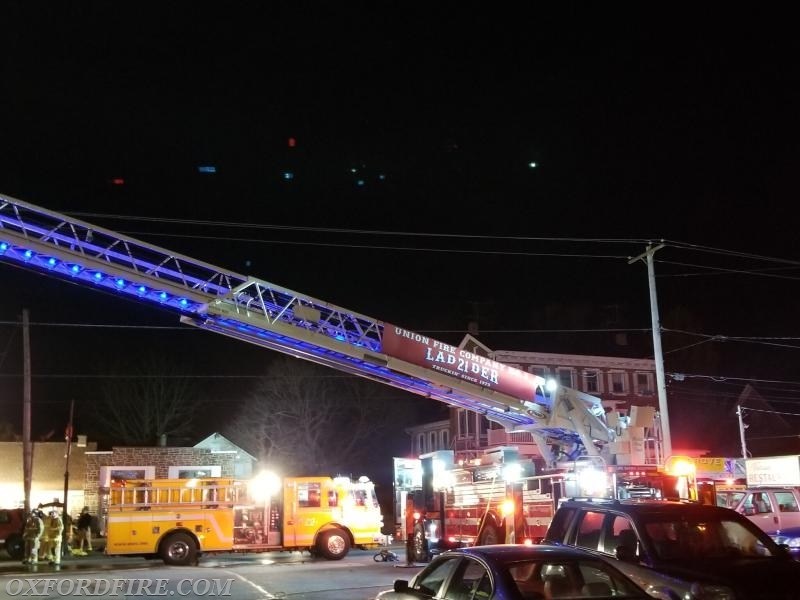 The crew from Ladder 22 performed a successful trench cut on the roof to prevent the fire spreading the full length of the building. Additional arriving units sent their crews to the Manpower Pool, where Chief 27 was the Accountability Officer. Once the bulk of the fire had been knocked down, the ladder pipes where shut down and Interior Operations were restarted for the duration. 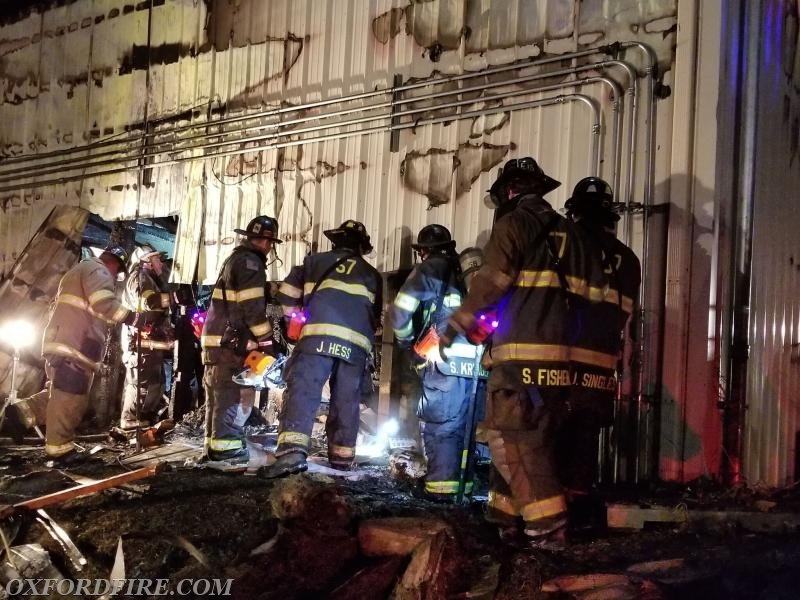 Crews worked to extinguish the remaining fire and to overhaul the interior building. 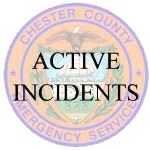 The Chester County Fire Marshals Office is investigating the incident. No injuries were reported. The final units were clear of the incident 0449 hours. Engine 51-2 (Bart Township) and Ladder 25 (Longwood) transferred into Station 21 to cover the District. 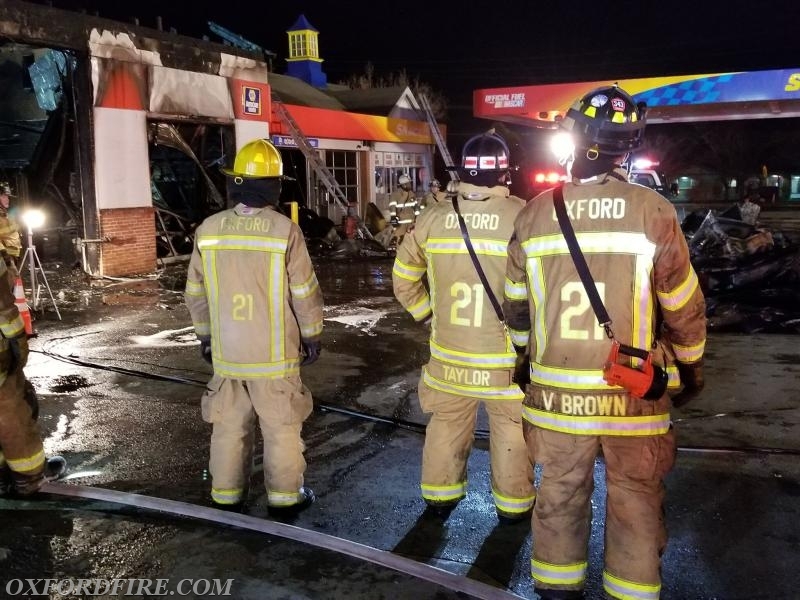 These units were brought into the scene to assist with clean-up before returning to their assignment at Station 21.